Showing results for tags 'griffin'. Happy B-day, Lux! I hope you like this depiction of your chracter... I don't get a lot of practice with griffins, So I'm sorry he came out a bit scratchy. I hope you like him! 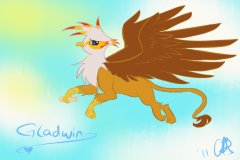 Name: Balador RP type: Canterlot Chronicles (CC) Gender: Male Age: Middle aged Griffin Species: Griffin Eye colour: Hazel Character colour: Gold and black Occupation: Knight, leader of the Rosalia Brigade Mane/Tail/Other: As a pureblooded Griffin from Talonopolis, Balador has the appearance of a sly eagle up front and and ferocious Lion on the back. His bird half is midnight black with well groomed feathers and fairly large wings. His lion side is the same color as a golden sun, with a few black specs in a few spots. Though you normally won't be able to see most of him as he normally wears a standard set of plate mail armor. Physique: Balador is fairly large, much larger than the average pony, but smaller then the average Griffin. He's built for lifting heavy objects, but isn't very fast or lightweight. It's very difficult for him to sneak around and because of this he will often force his way through when able to. Residence: Currently Traveling Unique Traits: Balador carries a sword and shield with him at all times. The sword is a fine grey weapon, made of steel. His shield is fairly average, only about two feet wide and 2-3 feet tall. It has a red rose on the front of it, which is also the symbol of the Rosalia Brigade. History: Balador was born in raised in the high social class in Talonopolis. His parents were fairly rich and due to this he was able to live in the rich district and live the privileged life. He looked forward to most days and never had to worry about many problems that griffins of a lower class had to worry about. He felt he deserved where he was in life. At a young age, Balador had shown promise in his strength, his father had noticed this and enrolled him in the squire-ship to become a knight of the Griffin kingdom. He was easily accepted, as another part of his family ran the school. There he learned several important skills for use later in his life. He had learned several tricks for numerous occasions, how to use his armor and shield right, and most importantly, swordplay. He was gifted with the sword, able to slash down many targets that had been set up for him after he had been taught many ethics with the sword. As he grew older he learned many things with his weapon, his armor, and fellow knights. These were things that had stuck with him until he had his first side job. A side job in the Knight's academy was often times similar to a test one would have to take to advance to the next class, in order for Balador to advance to the next ranking, he would have to complete his first side job. The task was a simple simulation, a griffin had something and a group of four knights needed to protect that griffin. The job was accomplished with ease and Balador knew that if the jobs remained like this, he would soon learn that's not the case. One of the things that one must do while in the Knight's academy is visit the armory that was in the lower quarters. This was where Balador learned about one of the most disgusting things in the world to him, thievery. When he had entered the armory he had learned that some griffin had snuck in last night and took most of the weapons in there. Without those items, how would the knights protect the city? He learned from this that the law is above else, the most important thing in the Equestria and should be followed without question. If one person were to break it and not be punished, the rest of the population would suffer. Crime hit an all time high in the lower quarters, at least until more weapons had made their way to Talonopolis. Years later Balador had graduated from the Knight's academy and made his way up the ranks in the Knight's of Talonopolis, his life hadn't changed much, he didn't get much action from where he was stationed but he did his job well. As years passed, so did ranks and soon he was a offered the chance to sponsor his own guild. Guilds were quite popular in the knights, they were often made up of five group teams who each specialized in different areas of expertise. However he preferred a solo act to groups and stayed in the city. Soon their was a group of pirates that had stolen from the city, though it felt more from himself for Balador. While on duty he was tricked and a group of pirates on an airship known as the Freewing had taken items from Talonopolis. When they got away and Balador was found he was made a mockery by the other knights. Balador blamed the Freewing's captain, Gangplank for his lost honor and he vowed to find that group and make them suffer to the fullest extent of the law. He formed a guild known as the Rosalia Brigade, implemented their symbol on his shield, (A golden wing with a rose petal on top of it.) and went on a long journey, following the pirates and looking for new members of the Rosalia Brigade. Character Summery: Balador knows he is strong and isn't afraid to show this skill when out on his adventures. He can be mean-spirited and down right cruel at times when speaking to those he believes are criminals. He takes the law very seriously and will never stray from it's guiding path. He can be very confident in all his abilities and isn't afraid to pull the 'Knight' title when someone mentions his armor, or questions his abilities. He will not take insubordination at all. Balador shows a list of emotions. He never truly trusts anyone unless they are a member of the law or a member of loyalty. He is disgusted by thieves and the like, and will try everything he can to arrest and send them to a dungeon. Though his main task is finding the pirate group sailing the Freewing and arresting their captain, Gangplank. He places this task above all else, including his and his comrades well-being. In combat Balador uses his sword and shield to defend himself and attack his enemies. As a knight he is fairly skilled in those two weapons but isn't very good at others. While wearing his armor, Balador is very heavy and can barely fly, if at all. His shield is durable however it isn't very good against magic and because of this magic attacks can be considered his weakness. "We will find those pirates, and make them suffer for all that they have done. That is our job Aselia, don't forget it." 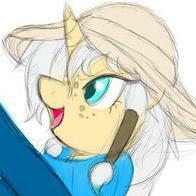 My Fallout Equestria RP character, and soon to be star of his own fic. Problem is writing a story for him is going to be hell. Well....here's Cross-Stitch's character aka Holly's luvaboy, Gladwin. ;3 Long overdue, I think. And I decided against vectoring....it just seemed to flow naturally when I drew it by hand. Do not fret, Cross-Stitch, for I shall soon make you your own character logo thingy, too. SO......As my character Holly was flirting with a griffon, this thought came to mind: Now, we all know it's not really possible for these two, but the IDEA is what I'm speaking of. 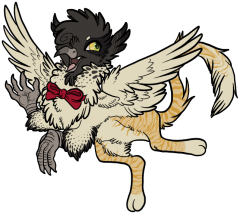 Griffon+Pony=Hippogriff? 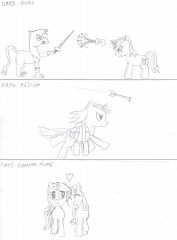 For that matter.... Hippogriff+Pony=Pegasi? 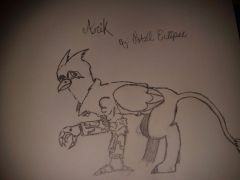 Or another hippogriff? Unicorn+Griffon=alicorn? (obviously not, I know they are forbade.) Hippocamp+Pony=...Kelpi? Pony? Hippocamp? Kelpi+Pony=Hippocamp? opinions, thoughs....answers? GO.